Your wellbeing is supported by more than just exercise. Family time, 'me' time, relaxation time – all combine to keep you healthy and happy. The R200 swim spa helps you sink into total mind-body wellness. With the R200, you can enjoy swimming in place, low-impact aquatic exercise, hydromassage relaxation, and family fun time – all at our lowest price for a jetted swim spa. You can comfortably swim in place with the RecSport's smooth, adjustable current. Or use the three airless swim jets for more core resistance during your aquatic workouts. 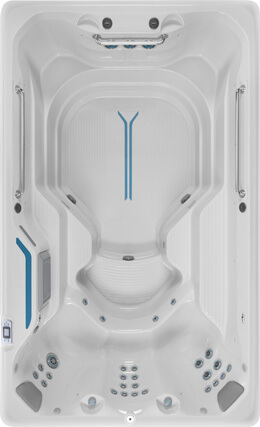 After your swim or aquatic workout, relax in your choice of five ergonomic spa seats with 27 hydromassage jets. Between the bucket seating, a 30"-deep reef makes an ideal kids' play area! This swim spa comfortably accommodates up to 10 adults when you're entertaining. 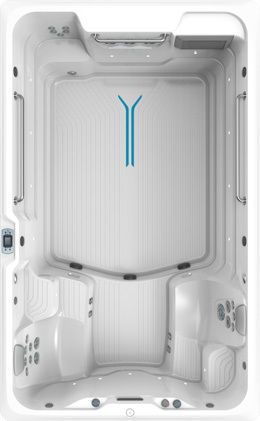 With the R200, you and your family get the essential swim spa features of any Endless Pools Fitness System: from the exercise-ready grab rails, to the durable frame and stylish, insulated cabinet. Dip into the R200 for fun, fitness, and relaxation – at home, on demand, and for the most affordable price. View Specifications.